Two major episodes of volcanic activity, widely separated in time, and caused by very different geological processes, have made Lochaber a classic region for the study of the development of volcanoes and the great chambers of molten magma that occur beneath them. Lochaber truly has a fiery past! In eastern Lochaber, volcanic activity was caused by subduction of ocean floor beneath the Caledonian mountain range, on the edge of the continent of Laurentia, between 430 and 400 million years ago. This process is happening today beneath the Andes mountains and the ‘Ring of Fire’ that surrounds the Pacific. 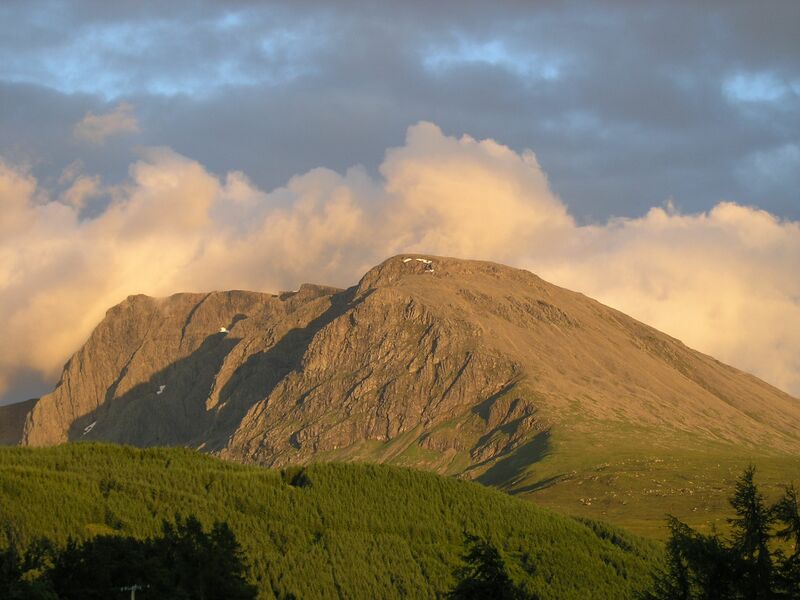 Two of Lochaber’s most famous tourist destinations, Ben Nevis and Glen Coe, are sites of volcanic calderas formed at that time. A caldera (Spanish for ‘cauldron’) develops when a volcano erupts and the magma chamber below empties. Without support, the rocks of the volcano’s summit collapse on a circular fault that forms a giant crater. The main road through Glen Coe takes you past mighty cliffs of lava and ash that fill such a crater. Although calderas are common in modern volcanoes, Glen Coe was the first ancient caldera recognized anywhere in the world. 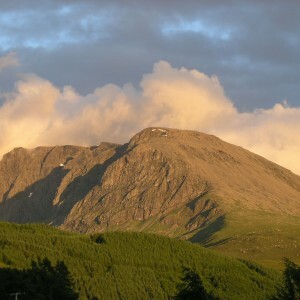 The great North Face of Ben Nevis is composed of a pile of andesite lavas (named after the modern Andes) which have collapsed at least 600 m on a circular fault into a large granite magma chamber, which consolidated to form the western flank of the Ben and the other mountains of Nevis Range. In western Lochaber, on the magical islands of Rum and Eigg, and the wild peninsula of Ardnamurchan, the most westerly point of mainland Britain, there are much younger volcanic rocks formed between 60 and 55 million years ago, when the North Atlantic had started to open. The mountains of Rum are cut in a world-famous frozen magma chamber, called the Rum Layered intrusion, and Adnamurchan is an equally famous example of a ring complex, where magma was forced up sets of cone-shaped fractures. The Isle-of-Eigg is largely built of lavas, but is crowned by a vertical ridge called An Sgurr, which is composed of glass formed by the welding of glassy ash particles. The Lochaber region of Morvern is composed of lavas that flowed from a third large volcano on the Isle-of-Mull.